Do you like chocolate oranges, the kind you get during the holidays, then crave them during the rest of the year? Well, I’ve solved that problem with extraordinary deliciousness for you! Chocolate, a slightly edgy taste of orange, rounds this out not-too-sweet cookie with texture and flavors that are off the charts. And what gives it this amazing zest and wonderful taste? You gotta try this one, I think it will be in your regular rotation of cookies. Enjoy! Prep time: approx. 30 min. *1 cup orange juice or 8 oz. In a bowl or cup, pour the Paradise Candied Orange Peel and 1 cup orange juice. Allow to sit for 30-60 minutes. Bring these ingredients to a full boil and cook 1 minute. Take off the heat and add in add in the oatmeal until it holds a form to your preference. Drop by teaspoons onto the prepared parchment paper. 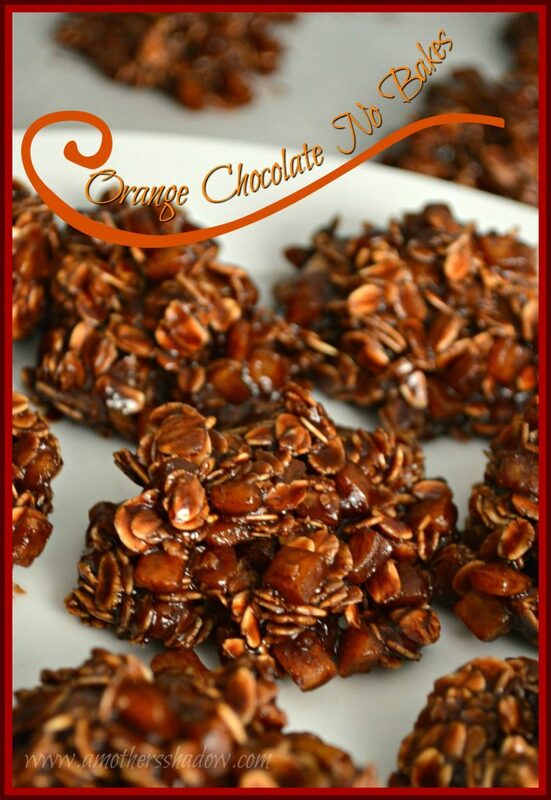 Allow the Orange Chocolate No Bake Cookies to set up for at least one hour.